Swizz may have outdone himself on the American Music Awards stage. 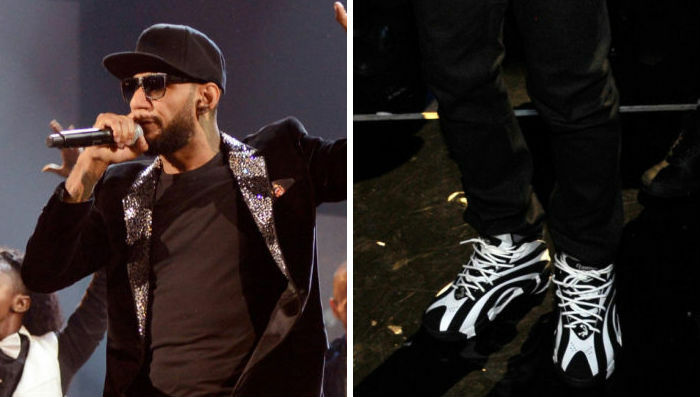 If showing up to the event in Shaq Attaqs wasn't enough, Swizz Beatz may have outdone himself on the American Music Awards stage. Performing his new single "Everyday Birthday" with Chris Brown and Ludacris, the hip hop hit maker and Reebok Classics front man laced up the upcoming Shaqnosis retro, which he first teased on Instagram last Friday. The Shaqnosis originally dropped in 1995 and may be the single most requested Reebok retro release. Thanks to Swizz, it's finally coming back, so stick with Sole Collector for future updates. In the meantime, enjoy a few snaps from Swizz's AMA performance below.